In spring of 2013, the Western Gallery at Western Washington University in Bellingham hosted a retrospective exhibition of Volume’s work. This show was the latest in the gallery’s ongoing Masters of Design series that has honored other contemporary design luminaries including Michael Vanderbyl and Art Chantry. Subtitled Our Work Shouldn’t Be Here, the 5000 square-foot exhibition captures the experiential essence of Volume’s wide range of work, revealing as much about our philosophy, process and personality as our work. It also addresses how to display design that is meant to be touched, read, and used without completely reducing it to a collection of rarefied artifacts frozen behind glass. 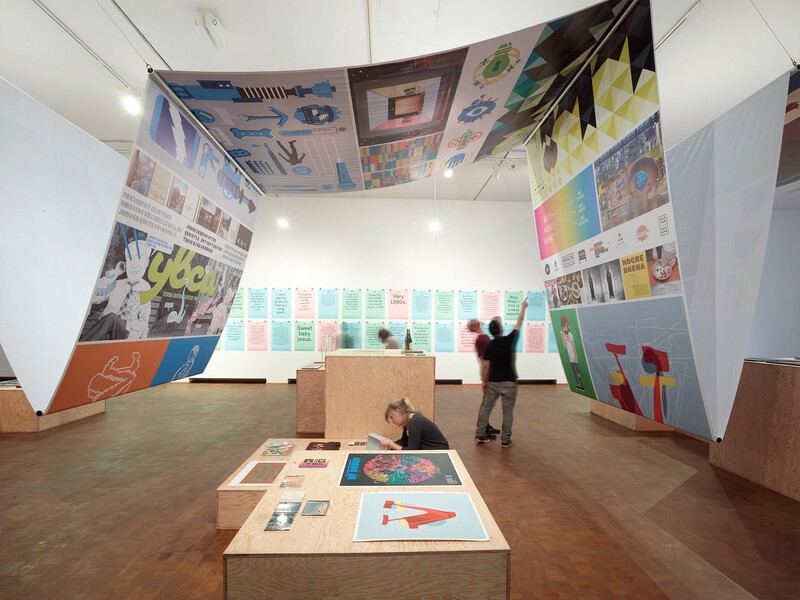 In the main gallery is a “Wailing (Poster) Wall” of inner thoughts, annual milestones, cheeky haikus, and outside comments about Volume’s work, both positive and not so positive. In the side gallery we projected a Skype link with our studio back in San Francisco where visitors could see the daily goings-on and even have an impromptu conversation with the people in the studio. Also in the side gallery, visitors could contribute to the exhibition directly by filling out any of the three sticker roll prompts and sticking them to a column.